Hello, Lucien here. I will be detailing out the changes that are coming for JAN 2019 in this page. As most of you know, Bastion has grown immensely over the last 2 years. We started in a small corner of Sembawng to the geographical center of Singapore. Its gone from 4 to 10 to 50 members now, and with some of you right there from the beginning. I'm appreciative of all of you and I would like to say thank you. I hope you'll continue with Bastion, and be part of driving force that keeps Bastion growing. It would not have been possible without all of you. The major changes that are occurring are the 1)Group Messaging 2)Payment and Booking System 3)Grading System. I'll be detailing each change below. We will be migrating from Whatsapp to Telegram. The main reason for this is that whatsapp displays telephone number of each person in the group chat, whereas it can be turned off for Telegram. One thing that I'm always concerned about is privacy and security, and while I understand that whatsapp is a convenient messenger as everyone has it, having a person's phone number in easy reach for another person is a huge vulnerability in privacy. I apologize for the inconvenience, but we have had to deal with potential incidents coming from within and from outside of Bastion this year. I will be adding everyone into the Telegram on the 10th of Dec, before Bashfest. Please take the time to download the app first. There will be a change in the pricing structure for 2019 as well. The fees for DEC 2018 will remain the same. The new fees will only begin in Jan 2019. While the previous fees were set when we were in Sembawang, we have a dedicated space for HEMA now, with far more equipment and far more sessions than before. For 2019, we are looking to expand once more, offer multiple types of sessions in a week, as well as to train instructors. What this mean is that we will be 1) doubling our training space, 2) include dedicated strength and conditioning sessions, dedicated stretching sessions, 3) different types of weapons per week, 4) help support the community by giving teaching opportunities to both local and foreign instructors. All this take time, planning, effort, and resources. I’ve done my best to try and ensure that the prices set forth are as reasonable as I can make it. I hope that everyone can continue to support us, and their love for the art. All subscriptions are tied to your email accounts, and will be assigned a unique code. After selecting the sessions that you want to book for, type your email in or put in your code to book the session. Remember to purchase your subscription before booking, as each individual session as a cost tied to it, and should be waived or paid for via your subscription. Below is the tentative schedule for 2019. As you can see, we introduced a lot more classes and variety. The final schedule will be confirmed before the first week of Jan. 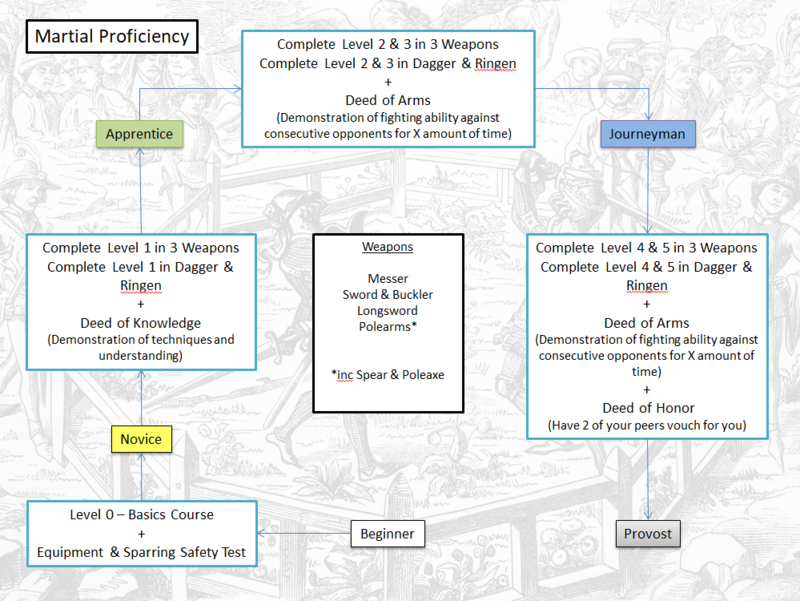 The martial proficiency grades will be following a survey of historical techniques from different weapon systems. The focus will be on the key texts from the 14th to early 16th century medieval German traditions, beginning with simpler essentials and branching out towards more complex and situational techniques. The list will be as such: Messer, Longsword, Sword & Buckler, Dagger & Ringen, and Polearms. The main focus is to teach the student a wide variety of weapons that a knight would have learnt. The modules range from level 1 to 5, with rankings of Novice, Apprentice, Journeyman, Provost. Moving from Novice to Provost will have you tackle various treatises from prominent masters of the medieval German tradition. To progress from one grade to another, will largely depend on your martial ability, rather than scholarly ability. It will focus on your ability to execute the historical techniques rather than being able to cite sources. Below is the chart that shows which master we will be studying at which point of time. While it is not entirely set in stone, it shows the progression and intentions behind the training. Please pardon that I have not given each module a title yet. As you can see, each module has a specific intention and a theme that I would like to cover. This next graphic is the representation of the progression system. I know people have said that the old grading system is not very clear. You'll find that this progression is far more streamlined and less obscure. You can head over to the ranks and grading page to read a little more. The first focus will be on being able to present oneself in front of students, ethics, professionalism, and learning class management. The second focus will be about learning the ‘who, what, when, and why’ of historical sources. As well, there will be an emphasis on careful research and interpretation. The third focus will be on the creation of material and lesson plans in order to deliver a lesson that fulfills key objectives. 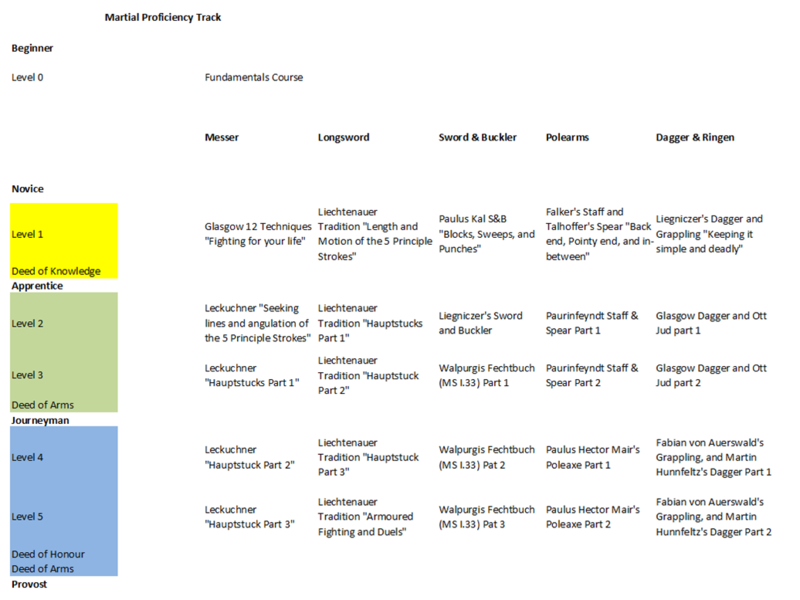 There will be 4 ranks, ranging from Assistant, Scholar, Free Scholar, and Instructor. While everyone would be progressing under the combat track, the teaching track will be optional and only with selected students who pass a set of criteria set forth by the principle instructor. The criteria will be as follows, 1) Professionalism 2) Disposition 3) Martial ability &Knowledge. Thank you for reaching the end. I know it was a long read but the changes that are happening are many. We hope that you have a better idea for what is to come in 2019, and are just as excited as we are.